According to the Steinbeis University Project Competence Concept, Master’s students work on projects parallel to their studies, managing in-house projects for the “sponsoring company” with the support and input of our university professors who are themselves active members of the business community. Projects are defined by the Institute, students and their companies, enabling integrated solutions in the fields of CSR and Corporate Ethics Management. Projects can be either research based or implementation projects inside a company. Projects give students the necessary skills to implement the acquired knowledge through real-world problem solving. Students apply and transfer the corresponding knowledge of methods and theory gained through the Master’s Program to a concrete, challenging task in a scientific manner. The projects enable students to follow their own interests and objectives throughout the course of study and result in better career opportunities. 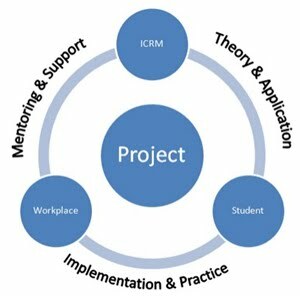 The Project Competence Concept also benefits the companies with which students carry out their projects. Companies gain access to the latest knowledge in Responsible Management and obtain a complete project solution that can be circulated immediately within the company and applied to new solutions, products, and services. They also have the opportunity to recruit from some of the best trained students in the field. The diagram above illustrates the linkages between the student, the Institute and their workplace vis-a-vis their project. Due to the broad geographical spread of our students and our international approach, it is fundamental that the program ensures access and flexibility. The Institute utilizes a variety of delivery methods, including face-to-face classroom learning, consultative lessons, live e-learning and self-paced learning. By combining these approaches with actual job tasks, students gain a holistic view of the subject matter from learning and working simultaneously. The study is accompanied by a program mentor who can provide students with support and advice about ways to improve their effectiveness in the program and answer questions.